First impressions count for a lot, so it’s important to dress for success in any job interview. Yet there’s a fine line between being well-dressed, and over-doing it. So let’s take a look at how to dress for any type of interview. We’ll cover how to dress for casual interviews, as well as business dress and professional dress for interviews, so you can walk in feeling confident and land the job! As a general rule of thumb, you want to dress at least as nice as the typical employee working there, and usually nicer. (For example just because the employees wear jeans doesn’t mean it’s okay to come to the interview in jeans. The interview is not a typical day of work). If you’re not sure what the employees wear, play it safe and wear a business suit. You also want to avoid wearing anything distracting, like bright colors or big earrings. Dress up, but keep it simple and subtle too. You want the focus to be on your interview answers, not what you’re wearing. You’ll also need to make sure your clothes look new and wrinkle-free. Don’t wear anything that looks worn or old. 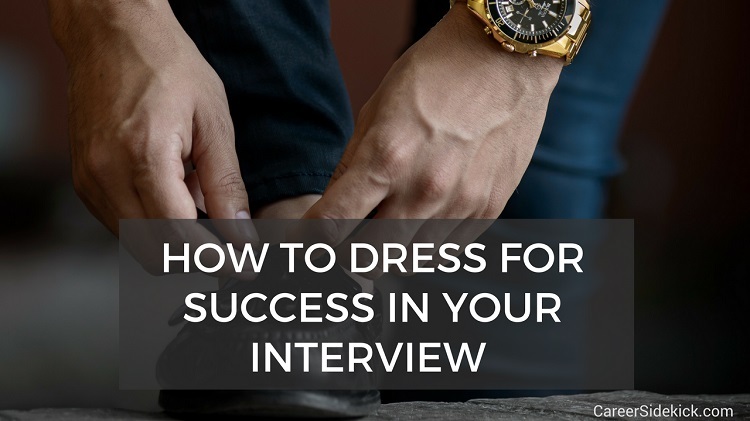 This is extremely important when you decide how you’re going to dress for your interview. Also, if you’re traveling to the interview in snow or bad weather, bring a tissue to clean your shoes before going in. You can step into the bathroom before entering to do this. Quick tip: If you have a video or Skype interview, you should still dress professionally. The same rules apply. A casual interview would include a “blue-collar” job (like landscaping), a retail job, or some tech jobs where employees dress casual and typically wear jeans, polo shirts or short sleeve shirts, casual shoes, etc. Casual dress for an interview should still follow some rules though, and in general you do *not* want to dress like a typical employee – you should go in looking nicer and being better-dressed than them. I would not recommend wearing jeans. Ever. Instead, if employees wear jeans, I’d wear khakis or nice business pants at the very least, with a collared shirt (tucked in). Also wear nice shoes. Even if you’re interviewing at a tech startup where employees wear sneakers, find some black or brown shoes to wear for the interview. As a general rule, it’s always better to be a little over-dressed in a casual interview, or any interview. You don’t want to walk in wearing jeans when the interviewer or hiring manager is wearing a dress shirt and slacks. So if in doubt, dress up. At the very least, wear “business casual” – dress shirt, tucked in. Dress pants. Black or brown “business” shoes. But no need for a tie, business coat, or anything like that in a lot of casual jobs. But if you’re not sure, do more, not less. It’s always better to go in over-dressed. That’s how to dress for a casual interview. Now let’s talk about if it’s a more formal work environment and you need to wear professional dress or business dress in the interview. Business dress or professional dress in an interview is different. In this case, you want to aim to dress as professionally as possible (without being flashy or distracting). This usually means a business suit or an outfit you’d wear to an important business meeting. Even if employees at a company don’t always stick to a full business or professional dress code (suit, tie, etc. ), you should wear that for the interview. Wear a dress shirt, tucked into business pants (not khakis!). If you’re a man, wear a tie. If you’re a woman you could also wear a professional-looking skirt instead of pants. What Happens if You Don’t Dress for Success in Your Interview? You might be thinking “okay, I don’t own a tie,” or “I don’t own nice dress-shoes,” etc. And you’re wondering what happens if you dress a little “down” for your interview. You’re going to be in there feeling uncomfortable, looking at an interviewer that’s dressed nicer than you. That’s NOT what you want. You also NEVER want to be dressed worse than any employees. In fact, you need to be dressed better than the typical employee. You’re going to feel awful if you show up wearing khakis and a shirt, and the employees are wearing full business-wear. My advice: Don’t risk it. Always dress nicer than you think you need. Invest in nice, professional dress clothes to interview in. If you dress for success in your interview, it’s going to pay for itself after a couple days of work at this new job you’re going to land, so it really is an investment, not an expense. That’s how to look at it. It’ll also help you feel confident in your interview. And it will help you impress the interviewer. If you go in dressed poorly and you regret it, or notice people are dressed up more than you, it’s going to distract you throughout the entire interview… you’re going to be worrying about that and wondering if you blew it, instead of focusing on giving awesome interview answers that land you the job. So it’s a lose-lose situation if you don’t put in the extra time and effort here to get it right. The good news is once you figure out one or two interview outfits, you can wear them every time. If you’re going to an afternoon on-site interview, and spending the morning working at your current job, you MIGHT be able to dress more casually. Or maybe you’re going for an early morning interview, and then going to your job immediately after, at 9 AM or 10 AM. Same situation- if you show up dressed much nicer than usual, they’ll know something’s up. You can ask the company you’re interviewing at for permission to come into the interview wearing business casual dress, so that your current employer doesn’t know you’re interviewing. I’ve done this and it’s been totally fine with the employer. Bring formal business attire, but leave the jacket (and tie, if you’re a man), in your car or in a bag. Then only wear it for the interview. Just wear a suit or nice business attire. Don’t risk it. Even if it’s a relatively casual job, showing up in a suit isn’t the worst thing in the world. If you follow the steps above you’ll be well-dressed and confident so you can stand out in your interview and get more job offers. And if you want all our best tips for how to get hired faster, make sure to check out our complete job interview answers guide too.